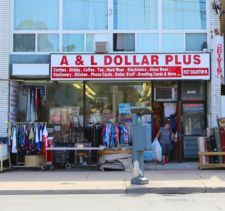 This quirky Dollar shop carries everything from bowls, cups, clothing to stationary and storage solutions at exceptional discounted prices. Bargain Club is a magic wonderland of incredible items and deals. The shop offers a unique brand of hygiene products most of which cost $2 or less. A short trip to the large enclave one will literally find thousands of discounted goods that will solve virtually any shopping need, with the added bonus of making it possible to avoid the numerous trips to a multitude of shops. Expect to find cookware to underwear. Champions Off-Track Betting has been ringing horse racing closer to home since 1993. Dollarama is all about the $! They offer a broad assortment of everyday consumer products, general merchandise and seasonal items with compelling value in convenient locations. A place where you can find brand name, premium quality second-hand and thrift items for amazing prices! Items range from clothing, home appliances, dishes, toys and much more! Get top dollar for your items now, visit Toronto's friendliest and most trustworthy jeweller today! At Oakwood Jewellery & Pawn Shop, they pay top dollar for your broken, used and unwanted items, including gold, silver, platinum, watches, cell phones, and more! They buy all kinds of items and get new stock in all the time. You are invited to stop by daily to check out they're selection. You never know when you will find a treasure! Sam's Liquidation Warehouse has been in the area for decades selling an assortment of goods such as clothing, dishes, bedding, Bubble pistols, bubble wands, handbags, kitchenware, toys, jewellery, shoes, luggage and more. Sky Tom's Flower and Gift is a local florist which stocks pre-cut flowers, mixed bouquets, plants, arrangements and a few cards. The shop offers local delivery, so you don't have to worry about dropping off your gift. Whether one needs a pick-me-up, a treat for a special person or planning an event these flowers are just the ticket. They also offer a select supply of indoor plants, seasonal decor and spring flowers and herbs for planting. Toronto Hyundai is a car dealership specializing in new and pre-owned vehicle sales and leasing. They also offer a Parts Department and Services and Collision Repair Centre. Wii Vape was established in early 2016 with a vision to bring the most unique flavours and quality products to those seeking a one of a kind experience. The Wii Vape team aims to provide patient and knowledgeable service to each individual. They are both ex-smokers and understand the process of finding an alternative to tobacco and can personally attest to the satisfaction that vaping brings. Whether selecting a new juice, device or seeking advice, they take pride in their friendly customer service.